Would you buy a Swedish car from this man? Johann Sebastian Bach (1685-1750) wasn’t widely recognized as a musical genius until the 19th century. He had two wives (not at the same time) who bore him a total of twenty children, which is a lot of mouths to feed. Bach spent over 25 years as an employee of the town council of Leipzig; his main responsibilities were teaching music to young people, and providing musical compositions for the town’s two biggest churches. Relatively little is known about the personal life of 17th-century painter Jan Vermeer, but he seems to have made his living as an art dealer, doing his own painting on nights and weekends. 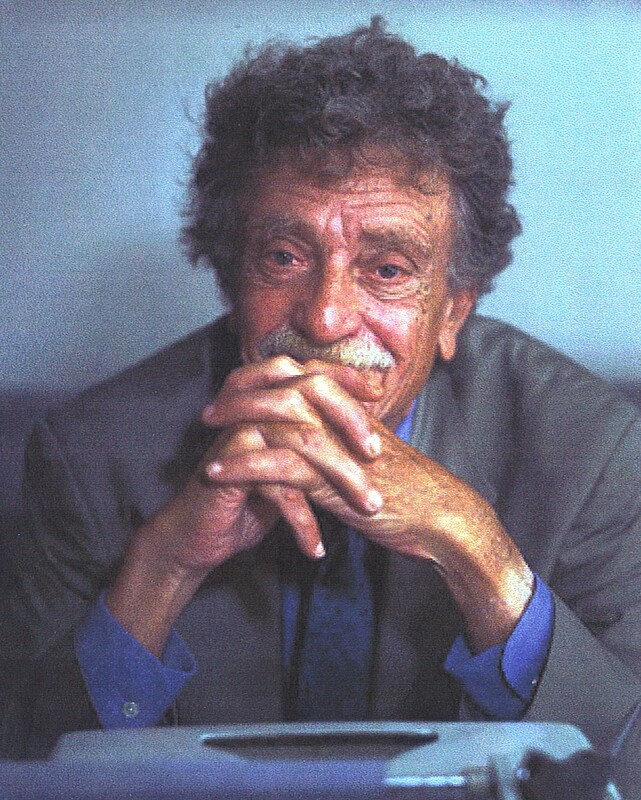 Novelist Kurt Vonnegut had a job in public relations for General Electric for a while, and at another time, was the manager of the first Saab dealership in the U.S. The dealership (on Cape Cod) went bankrupt in the early’60s; Vonnegut proved to be better at writing than at running a business. Two French composers held the same job at different times. Camille Saint-Saëns (1835-1921) and Gabriel Fauré (1845-1924) both served as organist at Le Madeleine, a prominent church in Paris. That’s an advantage composers have: they know how to play one or more musical instruments, so between movements of the symphony they’re writing, they can get a gig somewhere — in a church, or a piano bar near the airport. Some composers didn’t even have that as a revenue source, though. Pyotr Tchaikovsky worked as a civil servant in the Russian Ministry of Justice for three years, and American composer Charles Ives (1874-1954) had a long career as a life-insurance executive. French post-impressionist painter Henri Rosseau (1844-1910) was a toll collector for many years; when he retired from that government job, he supplemented his pension by playing his violin on street corners. Before winning the Nobel Prize for Literature in 1949, William Faulkner had failed at a number of menial jobs, including a stint in 1930 on the late shift at a power plant. Poet W.H. Auden taught English at University of Michigan and Swarthmore College, which I suppose was preferable to the other money-making option for a poet — writing greeting cards. One of the oddest day-job stories is that of William Sydney Porter, who was supporting his family as a bank teller. Porter was either terrible with numbers or too good with them; in 1898 he was convicted of embezzlement and sent to the Ohio Penitentiary. During the three years he was incarcerated, Porter had fourteen short stories published, all under the pseudonym O. Henry — which was probably more commercially acceptable than his other pseudonym, which was Federal Prisoner #30664. I never really considered “prisoner” as a day job, but it might not have been too much worse than some of the ones I did have. What about you? What’s the worst job — day or otherwise — that you ever had? This entry was posted in Art, History and tagged Gabriel Faure, Johann Sebastian Bach, Kurt Vonnegut, O. Henry. Bookmark the permalink. I spent one summer moving railroad ties in Texas. These were old ones that were being replaced and covered in sticky pitch and lying alongside the tracks in the sand; the underside being favorite places for snakes and scorpions to rest during the heat of the day. I got to lift the ties onto the back of a flatbed track for 8 hours a day and made $50 a week, pre-tax. A great inducement to stay in college and get that degree! If I’d seen one scorpion or one snake your next worst job could have been building my coffin. You might want to Google Peter Cook and Dudley Moore playing their extremely drunk counterparts, Derek & Clive. They do a couple of classic and humorously disgusting routines on the worst jobs they ever had. Me? I did two days in a steel mill and after almost being killed three times, I ran back to my job as a lifeguard. An experience which is currently putting my dermatologist’s children through college. That’s true, Jen, but before that I had a stint as a ride operator at an amusement park. What made that my worst job was my “uniform”. I had to dress like an elf — I had a little pointed elf hat, and wore liederhosen. Not cool when you’re a college guy. Or even if you’re a real elf.